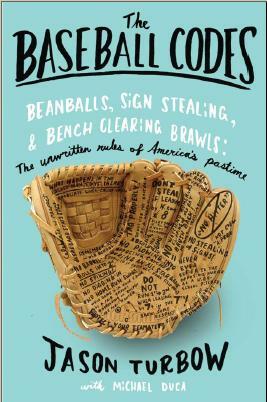 By their inherent nature, sports are built to promote the concepts of good guys and bad guys. It’s them-vs.-us in tribal glory, where the opponent is the enemy simply by dint of wearing the wrong colors. This is why when we are provided an actual heel—Alex Rodriguez, Barry Bonds, John Rocker—we so revel in lambasting him. 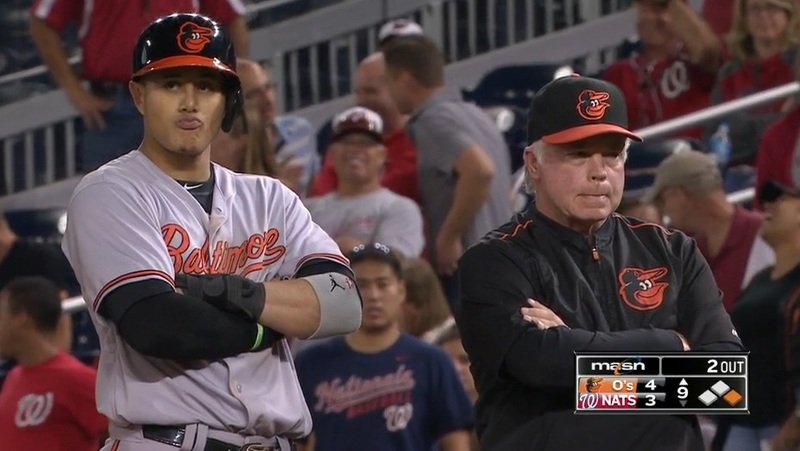 The series of events that began on Wednesday with Jonathan Papelbon needlessly drilling Baltimore’s Manny Machado had all the makings for just such a scenario. Papelbon, the crotchety closer who’s pissed off opponents and teammates alike with three clubs over the last five years, was perfectly positioned as the foil, serving up behavior so outlandish that his own right fielder, Bryce Harper, publicly groused that he’d probably be the one to take the fall for it. And then Buck Showalter stepped in. Finally, somebody who not only sees ludicrous things for what they are, but refuses to buy into a system that all but mandates senseless violence as an acceptable response mechanism. Machado hit a go-ahead homer off Nationals starter Max Scherzer in the seventh inning Wednesday, and admired it for a moment longer than Papelbon thought appropriate. Or maybe it was his pointing afterward, to the heavens, to the grandstand. Papelbon didn’t say. This goes beyond the simple etiquette of the unwritten rules. Once upon a time somebody like Papelbon could have gotten away with that kind of message pitch, informing the opposition that styling—even styling so slight as to have almost entirely evaded the TV replay—will not be tolerated, at risk of great physical peril. But baseball has moved on from that mindset, almost universally for the better. Machado did nothing outside the mainstream, his actions offensive only to the red-assed among us who cry that old-school retaliation is the only way to curb such offensive behavior. The fact that Papelbon took things a step further, throwing two pitches near Machado’s head, is on its own merits worthy of a considerable suspension. Modern-day baseball has graduated from making emotional slights physical. It’s not that skins have grown thicker over the years; it’s that as celebrations have become commonplace, most players just stopped caring about them. The question is no longer who thinks them worthy of retaliation, but who even notices. With that comment, Harper all but validated whatever response Showalter had up his sleeve. People filled the ensuing hours with discussion about when and how and on what part of the body Harper might wear one. And then we were surprised. Showalter knows whereof he speaks. Machado himself spurred a similarly embarrassing affair only last year, and the O’s skipper appears to want no part in revisiting any part of that mindset. Wednesday, Papelbon proved himself again as a heel who it’s fun to root against, but that, in sports, is old hat. In avoiding unnecessary conflict, Showalter gave us the opposite—not just somebody worth cheering, but somebody worth emulating, a clean-cut cat whose clear-eyed logic carried the day. With the Orioles still holding an outside shot at a wild-card spot, Showalter allowed his team to do the one thing that’s absolutely necessary for the good of its immediate future: concentrate on playing baseball. Well played, Buck. Well played. Update 9-25: Well, there it is: three games for Pap. But OK, what if he just lacked control? What if he was trying to pitch inside and missed his release point? Papelbon’s control since joining the Nats has not exactly been fantastic, and not nearly as pinpoint as anyone on the Nats had hoped. What’s the difference, really, between trying to pitch inside and missing by a few inches and hitting the batter versus trying to paint the outside corner and missing by a few inches and sending a pitch down the middle? Still a matter of control. Plus, the Nats were down by a run. Why put another potential run on base? Doesn’t drilling guys make a lot more sense when the game is already completely out of hand? Like if it were 10-3 instead, I could see intent a lot more than in a close game. The difference is doing it up around the head — twice. That’s more than just poor control. You’re right in that the score didn’t call for retaliation, but closers are generally immune from such duties, what with usually entering to protect a close lead. 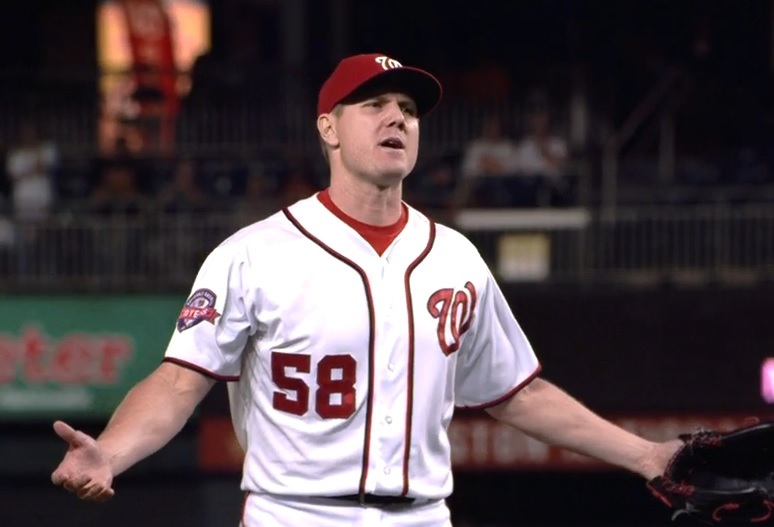 Papelbon, however, found himself coming in with his team trailing, and after getting two quick outs, putting a runner at first held minimal consequences. Papelbon himself all but admitted to it afterward. Instead of denying anything, he said that if that’s what Machado thinks, so be it. Without tacit admission it’s impossible to ever determine intent beyond a shadow of doubt, but this is pretty much as close as it otherwise comes.